I think the first one is my favourite and as I went on, they become less successful. This is the second. Originally, I designed it to be the other way up, but when I saw it lying on my table the other way up, I liked it better this way. Which way do you think is better? 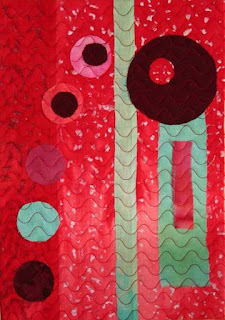 The Contemporary Quilt Group of the Quilters' Guild has an annual journal quilt challenge. I finally joined the group last year and decided that it would fun to take part. After all, how much work could it be to create one small A4 sized quilt a month? I also thought it would be fun to create something else than my main work. The theme for this year is 'A Shade of ...' and the first four had to be 'A Shade of Red'. As I had been thinking about composition, I decided I would just play with basic shapes and concentrate on the layout. My scribbled drawings at one inch in size worked well but for some reason, I'm not convinced by them as A4 pieces. I'll share the other three over the next few days. Any ideas for improvement? 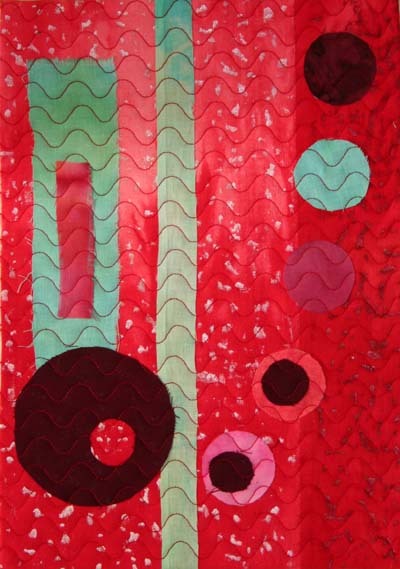 I'm really excited to tell you that in 2013 I'm having a solo exhibition at Bankfield Museum in Halifax of my 'Unsung Muses' pieces that were at the Festival of Quilts last year. The series is being expanded and there are going to be several new wall pieces to add to the ones already made. The other week I went to Bankfield and met with Karen Lewis, who manages the exhibitions. It was great to finally meet her after many phone and email conversations about a possible show. The space in the main temporary exhibition gallery looked perfect for my work and we also are considering some pieces in the main gallery to be seen as you walk up the grand staircase into the museum. We also discussed the possibility of hanging complementary work from the Bankfield collection in the main gallery. It is lovely to be so involved in the overall feel of the show and I'm sure that the next 18 months until it is hanging will fly by, so I'd better get on with making these additional pieces! I visited this exhibition the other day at the National Museum of Scotland. It was free with my ArtFund card so for probably the first time in my life, it cost more for the kids than it did for me! It was a 'fascinating' exhibition for many different reasons. The exploration of the science behind mummy examination and how it has developed over the years was interesting, particularly the screens explaining the 3D x-rays and CT scans. From an art point of view, I loved the exhibition design; it reminded me of several exhibitions I have seen at the V&A in London in the past. From my own personal research viewpoint, I loved the shape of some of the amulets and drew them all the way home on the train. I'll have to try and find more images of them on the web, as the exhibition book didn't seem to have any further information on them. The exhibition runs until 27 May and if you're in Edinburgh, I would recommend it. Yesterday I went to the Artists' Book Fair at the Fruitmarket Gallery in Edinburgh. It was a lovely event, with lots of exciting different books created by artists. The huge variety was amazing and as well as purchasing some of them, I came away greatly inspired and wanting to make more books. Even better, my elder son who was with me was also really taken with it all and hopefully he will want to make some with me. Anything arty I can persuade the kids to do with me is a bonus as it means more art time for me! I particularly liked the books by my friend, Catherine Anne Hiley (the picture above is of her, taken by my son). There was an amusing one about dogs and a beautiful one, called 'Selkie', based on Scottish myths about seals. 'Selkie' is so new that it isn't yet on her website, but other books, cards and prints are there for sale. Among the others, I liked the interesting pieces made by Mina Braun and also Lucy Roscoe's fascinating structures of trees, hot air balloons and rooms. We wanted to join in a workshop run by Rachel Hazell, but unfortunately by the time we arrived it was already full. I'll definitely be going to the next one! My diary for this year is beginning to fill up. I'm very excited with this latest event. I've been invited to spend a week teaching at the new School of TextileArts in Abruzzo in Italy in September. Over the course of a week we'll go exploring the area and take photos and find inspiration and then follow my techniques for making the 37 steps to make a number of small textile panels. I'm thrilled at the chance to do this in a totally different environment to the grey Scottish weather I make my work in. I'm looking forward to seeing how the Italian weather will inspire the participants and how it will influence their colour choices. It will be great fun for everyone and for me, not having to cook for a week will be fantastic! The main thing I need to do though at the end is make sure I make it back to Scotland for middle child's birthday. It's going to be cutting it a bit fine. There are more details on the website and also on the Facebook page, assuming unlike me, you can competently use Facebook! A few months ago I wrote about a new piece I had just finished. It was long and narrow and I thought I had included a long and narrow full photo of it, but when I looked the other day, the photo had been cut to square for some unknown reason. Hopefully the picture below has worked this time, although it is rather low resolution. 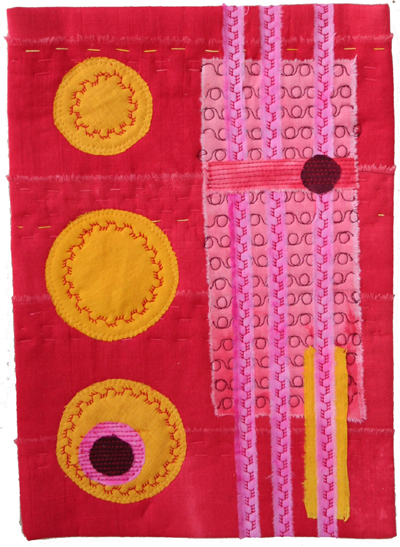 I entered it for a juried exhibition in Hungary, an international textile triennial and to my delight it was accepted. I posted it off to Hungary last week and the exhibition opens in June. Unfortunately I don't think I'll be able to go, but if you do manage please take some pictures and let me know what it looks like on the wall. I quite enjoyed making something to an unusual shape. I have a sketchbook which I bought from Oliver Twists last summer which is also long and narrow and I've been filling it with long, narrow drawings. It is in some ways more challenging to make a piece long and narrow, but on the other hand, it is also quite liberating as it is very different. Do you have a favourite format to work to or do you like variety? 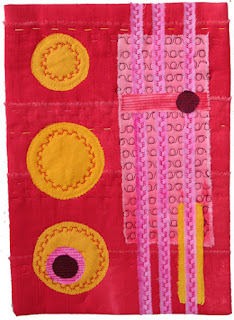 I'm really excited because this summer for the first time I've been invited to teach at the Festival of Quilts. I'm running two very different workshops, both of which have a strong design connection. The first one is Paper Pieced Bowls and over the course of a day, we will explore different shapes and how to make 3D structures from them using very traditional English paper piecing. I love the mix of old techniques being used in unusual ways. It will be a very relaxing day,with simple hand sewing, but I'm aiming to open participants' minds to the possibilities of taking patchwork away from being flat. The other day is Create a 37 Step, which is a bit of an oblique title. I do need to come up with better titles. This is essentially about getting over your fear of creating your own design for an art quilt. Over the course of the day, we'll look at practical as opposed to beautiful drawing and creating a mini quilt or textile panel from your drawing. I know many people are fearful of drawing having been told they can't draw. I believe this is rubbish and everyone can draw to some extent. Although you could be the one to come and try to challenge my belief! My moment of fame! At the Festival of Quilts last year, Valerie Nesbitt of Just Hands-On TV filmed a segment with me and my hanging goddesses. It has gone live on the Just Hands-On website today. You can see a tiny bit of it even if you are not a member. I think it is the first time I have knowingly been caught on film, but after getting over the nervousness of it, I think I could get used to it!